I won a copy of this book in a competition on facebook, with thanks to the publisher. I was first attracted by the gorgeous cover, the design of which is discussed inside the book (read more via the link below), and by the writer's name, as I've read and enjoyed some fiction by this author before. Also the period setting, being a First World War tale, made me want to read it. 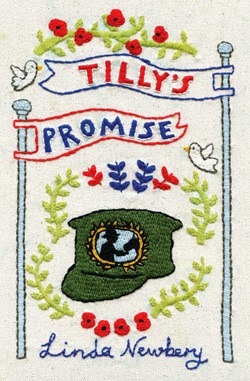 The story tells of Tilly Peacock and Harry, young sweethearts who both make a promise to each other, and learn that promises, even whilst made with love and the best of intentions, can prove difficult to keep. Harry goes off to fight in France, and Tilly volunteers as a nurse, this role taking her away from her home, and eventually to France. Tilly's dear kindhearted brother Georgie has learning difficulties, however, despite this, he is later called up to fight too. Tilly asks Harry to promise he'll look after Georgie. Neither of them can know what they will face in the years ahead, and how difficult things will be for them both. Tilly's Promise is a moving, well-written and engaging story told with honesty and warmth, and I really enjoyed reading it. This book is labelled as being dyslexia friendly, and the publisher specialises in bringing books to those for whom their may be barriers to enjoying reading; they design their books to try and minimise the barriers - read more here. I love the cream-coloured pages and the clear, decent-sized font. At just under 90 pages, the story is substantial enough but not so long as to be daunting. I imagine that all these aspects, and the others that they've thought about, are of a real help to uncertain or reluctant readers. This is the first book I've read from this publisher and on the basis of this one I'd certainly look out for others in the future. 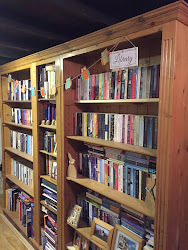 Published by Barrington Stoke - Edinburgh-based independent publishers, specialists in dyslexia-friendly books for children and teenagers. This sounds like a lovely story and I'm intrigued by it being dyslexia friendly. My father struggled with dyslexia and I know it took him years to really be able to enjoy reading. Thanks for sharing! The author and the dyslexia friendly concept are new to me but I definitely want to look into it more.